Mom does so much for us, doesn’t she deserve an amazing gift? Yes, I realize that it’s after Mother’s Day, but that’s not the only time that you can give her an amazing gift. Because she is soooo awesome, we’re giving away the 2018 limited edition Mother’s Day gift set from Chamilia. In case you’re not familiar with the Chamilia brand, it’s a fab, higher end jewelry line by Swarovski. The line consists of sliding charms and jewelry to place them on. Sort of like a modern interpretation of the charm bracelet. Chamilia creates great charms with precise attention to detail and amazing craftsmanship for lots of life’s little journeys and adventures. We’ve partnered with Chamilia to provide one lucky reader a Limited Edition Mother’s Day Gift Set. 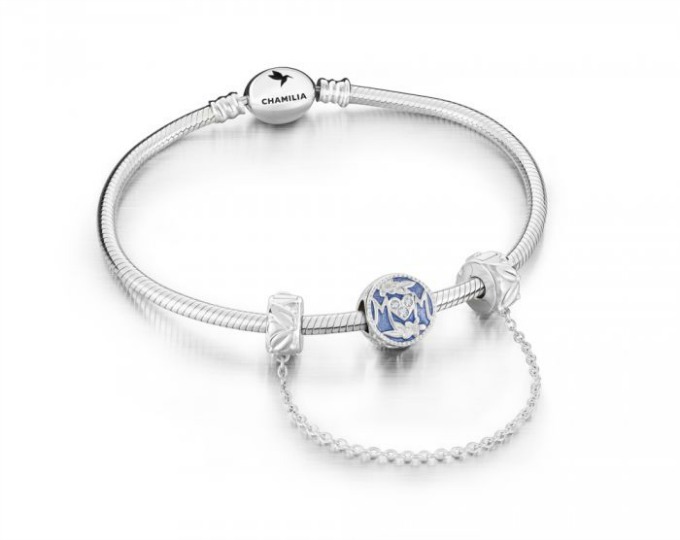 This consists of the limited edition MOM charm, which is sterling silver with enamel detailing and Swarovski accents. It also comes with an Oval Snap bracelet and a Laurel Safety Chain Lock. Simply stunning! MSRP is $150. Ready to enter to win this gorg bracelet set? Do so in the Rafflecopter widget. Now that you’ve entered here, hop on along to the other great giveaways. Good luck!